Sood, born in Mombassa, Kenya, grew up in western Canada and makes his home in BC. He has appeared in more than 40 television and feature film productions and currently is filming a comedy, ‘Fathers & Sons’. He’ll also appear in the much-anticipated film, “The Watchmen”. Finding time to spend with your children as a divorced dad is difficult enough, but add to that hectic filming schedules and it seems nearly impossible. Nevertheless, Manoj Sood, his ex-wife, Lorraine, and their 10-year-old son, Kama, seem to have found a friendly way to make it work. 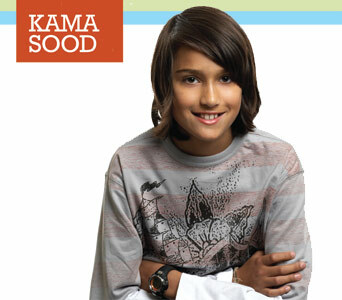 ParentsCanada: How old was Kama when you divorced and what is your current relationship with your ex-wife? Manoj Sood: Kama was about 4 1/2 years when my wife and I began to live separately. Lorraine and I are good friends and even socialize. She’s very close to my family. In fact, we had a huge Sood family reunion recently and she was there with her partner, Stu, and fit right in. We all had a great time with zero awkwardness. PC: How do you and Lorraine cooperate so that your relationship with Kama is retained? MS: We’re flexible and adjust to each other’s schedules. We play it by ear very effectively. This way Kama doesn’t feel tied to or limited by a specific schedule. I know this method would not work for all divorced couples but it works well for us. PC: How much time do you get to spend with your son? MS: When I am filming, he’s with his mom most of the time, except for short breaks with me. In the off season, for about six months, he’s with me every day after school until early evening, a good chunk of Saturday and Sunday and he also stays at my home – sometimes three nights a week. Occasionally he comes to Toronto and spends time with me on set. The director lets him say, “action” and “cut” and he likes that. PC: Looking back, in what way could you have made the impact of the divorce less for your son? MS: I think it’s impossible for divorce to have zero impact on a child. He was very young when we split up, so I didn’t try to explain that his mom and I were living apart. I remember, when I was young, my parents speaking to me as a child about various matters and I could always tell when something was being glossed over. PC: How do you handle the differences in your parenting styles? MS: I depend on his mother to keep Kama’s schedule. I organize fun times and vacations. Each year, since he was about three, we have gone on father and son fishing trips. His mother is much more hands on in following his homework and progress at school. It makes sense for her to take the organizational lead because she is much better at it than I am! 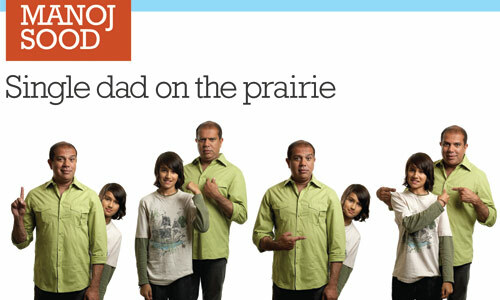 PC: What’s the best thing about being a divorced dad? MS: That’s a tough one! I guess it is fair to say that those of us who are divorced are divorced for a reason. The issues that lead to a divorce are never pleasant. The one good thing about our divorce is that we no longer find ourselves in incompatible situations. PC: What do you think is the worst thing about being a divorced dad? MS: Loneliness during social and family occasions. Nothing to do at Christmas or holidays. Kama has many cousins his age on his mom’s side, so when it comes to holidays I always let him spend those times with them because it is more fun for him. PC: Tell us something funny about your father. Kama Sood: Sometimes he rents four movies and watches them all in one day and he sings really loud sometimes when he’s driving. PC: Do you feel your father would like you to become an actor? KS: I think he would like it but I’m not sure if I will. PC: What piece of advice would you like to give your dad? KS: To tidy up the bathroom after he has his shower. PC: Tell us something about yourself that we’d be surprised to learn about you. MS: I am shy – very quiet until I get to know someone. As a young man, I felt I didn’t fit in. After playing Baber for a few seasons I slowly came to understand my attitudes more clearly and came to terms with the self esteem issues I had when I was younger. As an actor, I had to make decisions about who Baber was and why he was the way he is. That helped me to understand my own extreme shyness and low self esteem. I then used this to complete the ingredients of Baber’s character. So indeed, playing Baber has taught me a bit about myself. PC: Do you feel you understand your son? PC: What surprises you the most about Kama? MS: How sensitive and empathetic he is. He is very careful about saying anything negative about someone. He assumes that everyone is as sensitive as he is and he treats them accordingly. PC: Would you want Kama to follow in your career footsteps? MS: Only if he has no choice... and by that I mean that for many of us actors it becomes something that we love so much that we have no choice but to pursue it. Sometimes in life you just know what you want to do. I want Kama to do what he wants to do. I believe we can educate our children and we must do what we can to instill a healthy sense of self esteem. If we give them these skills I believe they can achieve whatever they want and become what they choose. PC: What is the most valuable lesson you have learned by going through divorce? MS: That tomorrow is another day and that things/life always gets better. PC: What tips do you have for other divorced dads? MS: Put the child before the pain of divorce. Don’t use your child as a pawn. Remember that it’s your marriage that is coming to an end – not your relationship with your child. Never, and I mean NEVER, say anything bad about your former spouse to your child. PC: What advice would Baber give you? MS: To teach my son important family and cultural values. He may also try to advise me to convert to his religion! PC: What advice would Baber give your son? MS: To be a good boy and to listen always to his Mommy and Daddy.